Antiquities Act • U.S. Rep. Chaffetz says Nevada designation could derail Utah's public lands process. 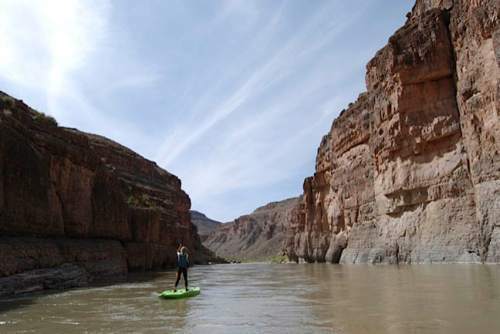 Brian Maffly | The Salt Lake Tribune Olivia Bailey of Salt Lake City paddles down the San Juan River downstream from Bluff. The cliffs on the right side of the river are part of three different conservation proposals centered on Cedar Mesa. The left side of the river is the Navajo Reservation. Al Hartmann | Tribune file photo U.S. Secretary of the Interior Sally Jewell says she wants to see the compromise plan in writing to protect wild areas in Utah. She didn't raise the threat of a monument designation, but President Barack Obama has warned he would act if Congress doesn't. One area American Indians and environmentalists seek to protect is the Bears Ears in southeastern Utah. .
Utah has more public land protected from development than it has in private hands, 12 million versus 11 million acres. That fact alone is enough to argue against new national monuments in Utah, a key aide to Gov. Gary Herbert told the Legislature&apos;s Commission for the Stewardship of Public Lands on Thursday. "These precious lands that we all agree deserve protection are being protected. There is a common misperception that these areas are under attack. The last few precious resources are threatened," said Cody Stewart, energy policy director. "A third of all federal land in Utah is under some protective status." The one-time aide to U.S. Rep. Rob Bishop gave the report to lawmakers in light of the Obama administration&apos;s announcement last week of three new national monuments, including a 704,000-acre slice of Nevada where the Great Basin meets the Mojave Desert. The president has used his powers under the 1906 Antiquities Act to designate or expand 19 monuments, including 11 in Western states covering 2.1 million acres. Stewart contends many of Obama&apos;s monuments are larger than necessary, but conceded the courts have consistently upheld such large designations. Observers on both sides of Utah&apos;s public lands divide believe the president has a monument covering a vast Utah landscape, which hasn&apos;t seen a designation since Bill Clinton&apos;s surprise creation of the 1.9-million-acre Grand Staircase Escalante National Monument in 1996. Meanwhile, Utah&apos;s members of Congress complain the recent Nevada designation could undermine the public lands process underway in several eastern Utah counties. Lincoln County, home to the new Nevada monument, went through a similar process in 2005 that resulted in 700,000 acres of new wilderness designations. Now the president has created a monument of the same size in the same region. It&apos;s wrong for a president to unilaterally upend such agreements with the stroke of a pen, said U.S. Rep. Jason Chaffetz, whose district covers three areas that are being considered for monuments: San Rafael Swell, Greater Canyonlands and Cedar Mesa. "People in those communities who have been there for generations want to get out from a cloud of uncertainty and perpetual lawsuits," he said in an interview. Leaders in the affected Utah counties are working on land-use plans that will be included in Bishop&apos;s public lands bill. He wants such counties to be excluded from future designations. "I am not going to participate in a process without it being fair to both sides. The fact that the Antiquities Act is there is making a lot of this possible, but without getting rid of it we can&apos;t get to a final resolution," Chaffetz said. "There will be more land conserved under this plan than if president after president made unilateral decisions to designate land." 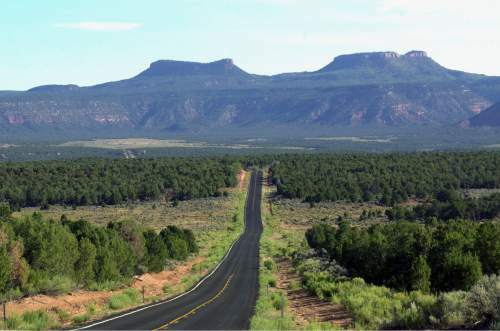 San Juan County, for example, is finalizing a land plan that is expected to protect parts of Cedar Mesa and Bears Ears Buttes in response to calls from conservationists and tribes. If Obama designates a monument there, "I would be so disappointed and frustrated and I would use every muscle I have in the [House] Oversight Committee to get the administration to explain it," Chaffetz said. "The only reason it hasn&apos;t happened yet is because the Obama administration has been allowing this process to play out." Because of controversial designations in the past, Alaska and Wyoming have been exempted from future presidential uses of the Antiquities Act. The law has been invoked by 16 of the 19 presidents since 1906 to establish 145 monuments, most actively by Franklin Roosevelt, Stewart said. Four of Utah&apos;s five national parks began as monuments designated by presidents. However, State Rep. Ken Ivory, R-West Jordan, told the commission that Utah has suffered enough under the Antiquities Act&apos;s heavy hand, and he took a swipe at the Bishop process. Ivory is the leader of a movement that wants to transfer most federal lands in the West to the states. "Are we going to surrender before we are captured, so that we lock up lands so that we don&apos;t get a monument?" he asked Stewart. Ivory blamed the Grand Staircase designation for a host of problems in southern Utah. "We have communities that are disappearing. Garfield is a ghost county. This is horrific for the consequence to our state, our communities, the schools, the health of the lands," Ivory said, referring to a recent declaration of a "state of emergency" by Garfield County commissioners. "They are losing their schools, they are exporting their children, they are exporting their families." However, Escalante business leaders dispute the premise for the Garfield declaration, claiming their town&apos;s economy has never been stronger, thanks in part to the monument. "There is no state of emergency as far as we are concerned. It has been contrived by the county commission and the mayor," said Chamber of Commerce President Dennis Waggoner, co-owner of Escalante Outfitters. His family&apos;s resort, which employs 18, is 98 percent booked this season. "We hired a person (in June) to help in the kitchen. Most of the people we know are looking for people to work," Waggoner said. "We are having a record year. We have seven cabins and are building two more. Tourism is doing well. Our area has been discovered."